Happy National Caramel Day, everyone! 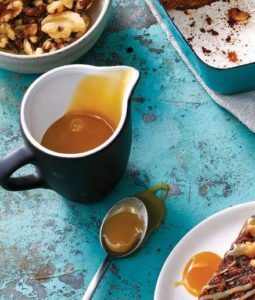 Let’s celebrate together with a couple of gooey caramel Martina’s Kitchen Mix recipes. You’d think baking homemade caramel would be a sticky mess, but I can promise you it’s not! Trust me, the homemade stuff is worth it and with my recipe it becomes easy as cake (Apple cake to be specific… but we’ll get into that in a second). Let’s start off by making the homemade caramel sauce and then I’ll get into the Apple Cake, where it will be used as the topping! Cook the sugar, half-and-half, butter, and salt in a small saucepan over :medium-low for 5 to 7 minutes, whisking slowly until thickened. Remove from the heat, and let cool slightly before serving. Preheat the oven to 350 ̊F. Beat the butter with a mixer at medium speed until fluffy; gradually add the sugar, beating well. Add the eggs, 1 at a time, beating just until blended after each addition. Add the apple, beating just until blended. Whisk together the flour, baking soda, cinnamon, cloves, and salt; add to the butter mixture, and mix just until blended. Stir in the walnuts, if desired. Pour into a lightly greased 13- x 9-inch baking pan. 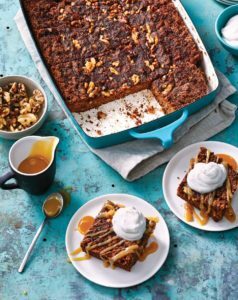 Serve with Homemade Caramel Sauce and, if desired, whipped cream or ice cream.TIP: You can use most any kind of apple. Gala or Red Delicious work great too.